So, the enemas and colonoscopy prep drinks were a bit much. My next phase of experimentation was more positive and resulted in some lasting practices I'd like to share with you (hopefully they bring you some joyous and easy movements). 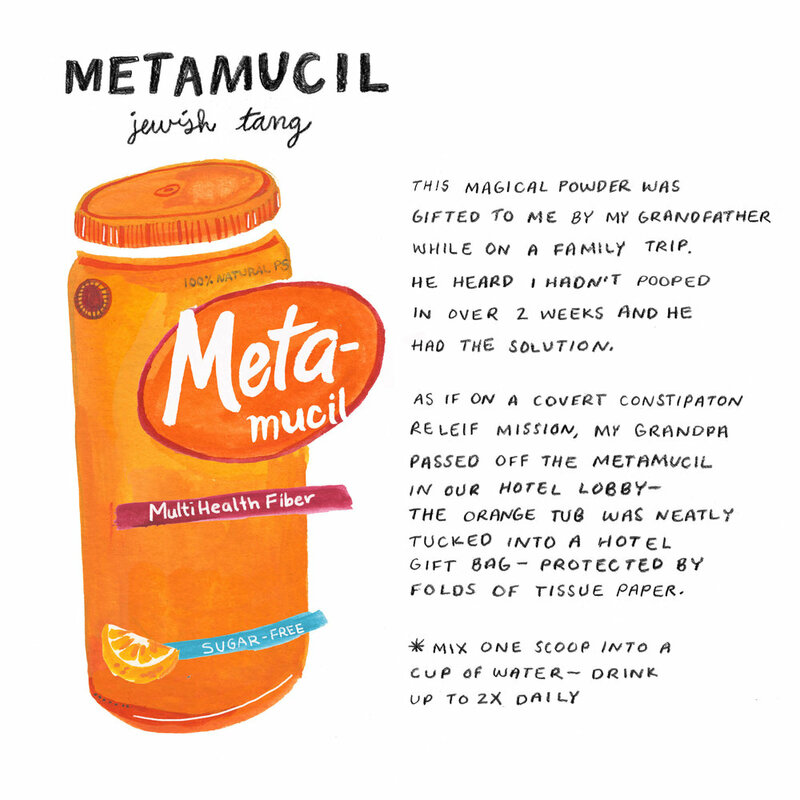 Metamucil is my rock. My everything. I started drinking it about 5 years ago, and it has gotten me to the point of pooping daily most weeks -- a luxury I had resigned to living without. It's an orange-flavored and orange-colored powder that also comes in pill form if you prefer. Personally, the pill did nothing for me aside from major bloating but it may work for you! Also, this is huge: Metamucil comes in travel packets. Super convenient (especially since pooping while traveling is nearly impossible. More on that to come). *Be sure to mix the powder in cold water, the colder the better (pro tip: bathroom sink water is infinitely colder than kitchen. It's wild). With warm water, you get this slightly horrifying gelatinous situation -- one that I assume mimics how the powder reacts inside the body. Which leads me to this note: you may notice some goopy orange substance in your biz once you do start going again, this is normal. In discussing her Miralax habits, Sophie made a very crucial point that's applicable to both these powders: these are not quick-fix laxatives, these are meant to become routine and really don't start to work their magic until used consistently. Sorry to tell you this, but chances are Metamucil/Miralax will probably make you bloated at first -- but push through it so you won't have to do much pushing later. Stay tuned for more tried-and-true best pooping practices! Do you have products/foods/habits that keep you regular? Share in the comments! If you prefer a less public domain, feel free to email me at ariella.elovic@gmail.com. I'd love to include your tips in future posts.